Recently I was blessed with the opportunity to visit Disneyland for the first time in 20 years! 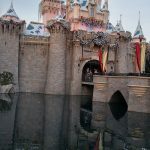 And I can honestly say I was in awe of the magic that abounds all throughout both Disneyland Park, Disney’s California Adventure Park, and the entire resort area. style seating areas throughout the resort lobby and the lobbies of the various buildings, you definitely felt as if you could have been magically transported back in time. Adventure theme park, it reminded me of a fun Coney Island style adventure from days gone by. 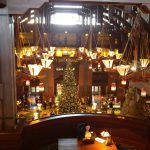 When you visit Disney’s Grand Californian Resort and Spa, you’ll be transported to a lodge somewhere in Yellowstone National Park. With high vaulted ceilings and rustic design, you can’t help but want to cozy up and enjoy a stay here! Plus it has it’s own special entrance to Disney’s California Adventure Park as well. 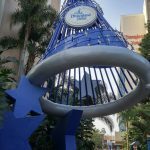 This is the entrance that is used for Magic Mornings early entrance for Disneyland Resort Hotel guests. And, unlike Walt Disney World parks, in Disneyland and Disney’s California Adventure, early admission is STRICTLY limited to resort guests. The biggest bonus to Disneyland Resort as opposed to Walt Disney World Resort, I think, it accessibility. 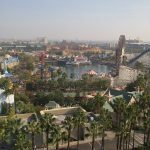 You can easily walk from any of the 3 resort hotels to Downtown Disney, Disneyland Park, and Disney’s California Adventure. Plus, once you have gone through security (bag check and metal detectors), you can go back and forth between parks at your leisure without going back through security again. That was absolutely amazing to me. The most common reason I hear for NOT visiting Disneyland Resort is it’s sice compared toWalt Disney World Resort. This is actually a very GOOD thing. You can easily take little ones back to your room for a nap or mid day swim. You can zip over to Downtown Disney for some shopping, or park hop like never before! Stay tuned for my next installment of this blog series. I’ll go into more detail about the parks themselves and package options. If I’ve peaked your interest and you want to start planning your own Disneyland adventure, that’s easy, too! 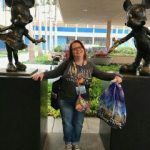 Get with one of our amazing travel pixies and we’ll give you the full scoop and help get your Disneyland vacation planned and sprinkled with pixie dust!